A trip back in time to learn about the first Jews who came to America and the historical Synagogue Kahal Zur Israel (Hebrew: קהל צור ישראל, "Rock of Israel") built in 1636. What do we offer with this tour? * Look for passengers from the cruise port or the hotel. * Private car and bilingual private guide. 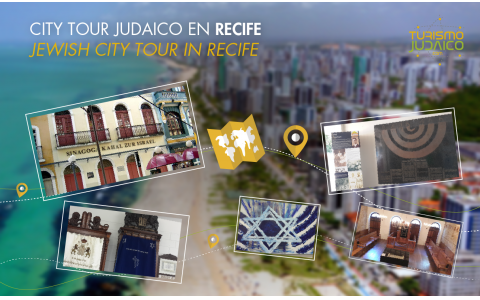 * Guided tour in the Jewish Historical Archives of Pernambuco and historical Synagogue Kahal Zur Israel. * Visiting the Marco Zero, historic center of the city of Recife. Frequency: Every day, except Saturdays and Mondays, that the museum is closed. Duration: 3 hours. In the morning or afternoon. It seeks and takes passengers back to the hotel or the cruise port. - If you want to arrange another meeting point, such as hotel or airport, please advise, for logistical coordination.